What better way to soothe baby's sore gums than with the comfort of Bright Starts™ Vibrating Teethers. Baby will love the gummy textured vibrations that gently massage and soothe gums. 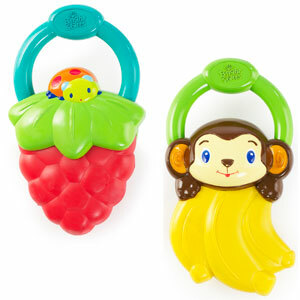 Multiple teething surfaces and easy to grasp handle are sure to ease and comfort your little one. Baby can have two fun characters to choose from!